Once upon a time, a show called New Girl debuted. It was about a bright and idealistic woman who sang a lot, and how she interacted with her three male roommates whom she found on Craigslist. Over time, New Girl has evolved from a show about Jess to a show about Nick, Winston, Schmidt, Cece, AND Jess. I’m not saying that Jessica Day isn’t needed anymore. 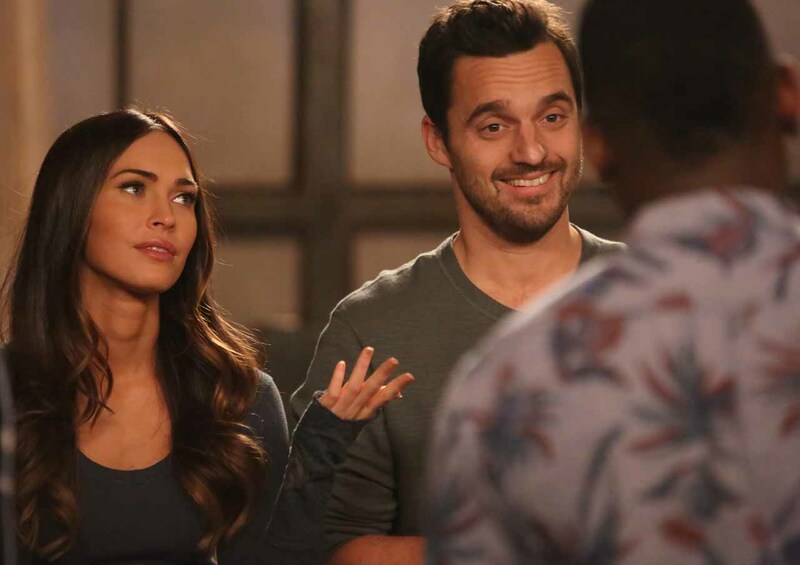 I think these episodes without her have proven that the show would not be the same without the titular “new girl.” But the FOX sitcom has found, over the years, that it doesn’t need to rely on Jess in order to tell a story. Every other person in that loft is just as weird and interesting and compelling. It’s through the writers slowly and subtly exploring stories without Jess that have allowed them to write in Zooey Deschanel’s absence and yet still maintain a strong, hilarious sitcom. Enter: “Wig.” In a lot of ways, this episode is so simple that it’s kind of brilliant. It doesn’t do much in the way of revolutionizing storytelling or extracting a whole lot of meaning, but New Girl is in its fifth season – it doesn’t need to reinvent the wheel, here. This is a show that knows what makes it funny (miscommunications, misunderstandings, and shenanigans plus a whole lot of tweetable Winston lines), and it sticks to it. New Girl has always been at its best when it’s utilized each of the actors within the cast to their full comedic potential and honestly, “Wig” was such a perfect example of that happening. Plus, Megan Fox was really well-integrated in this episode, too. I still think I loved her performance in last week’s “Reagan” more, but this week allowed her to have some great interactions with Lamorne Morris, as well as just hilarious shots of Reagan reacting to situations happening around her. The plot of “Wig” is pretty simplistic: Raegan doesn’t want to spend a lot of time (or really any time) with her roommates, and Winston is annoyed by this and makes it his goal to force Raegan to spend time with him. Meanwhile, Nick’s crush on Raegan is literally interrupting Schmidt and Cece from having any alone time whatsoever. In order to curb his feelings, the pair decides they need to find a way to prevent Nick from idealizing her. So they concoct a story about how Raegan wears a wig, knowing that this little tidbit of information will send Nick on a spiral and he won’t be interested in Raegan anymore. Unfortunately for Schmidt and Cece, this plan spectacularly backfires when Nick goes snooping in Raegan’s room and discovers a photo of what looks to be a young boy as well as two different fake IDs with Raegan’s photo on them. Schmidt and Cece put their issues with Nick’s boundaries aside and decide to investigate themselves. The element that “Wig” focuses on more than anything else is that the group doesn’t know Raegan. They know absolutely nothing about her because she won’t spend time with them and won’t open up to them. How else then was the group supposed to know anything about her to be true? She could be a criminal on the run for all they know. And you can see that Raegan feels a twinge of guilt for not opening up and for that being the thing to cause her invasion of privacy. Raegan is such a guarded character that it makes her such an interesting foil to Jess who pretty much tells everyone her life story as soon as she meets them. (Case in point: the pilot episode’s opening scene where she tells the boys why she’s looking for a new apartment.) Back then, the men were comfortable to lead lives where Jess was just the girl who lived with them and paid her rent on time. Now, none of them are content to have just a roommate — they want to know the person they’re living with and become friends with them. It’s such great and organic character development. And as I discussed last week, the gang has unintentionally become more and more like Jess as the years have passed by. And they don’t even realize that this is what is happening to them, which is probably the best part. Slowly but surely, this group has become the kind where they make an effort to get to know and care about the people in their lives. I love that “Wig” provided us more insight into Raegan as a character. Not only is she a loner, unwilling to eat dinner with her roommates and instead choosing to jog by herself and hang out alone, but she’s also really bad at breaking up with people. Namely, a girl named Camilla with whom she has an apparent relationship but a noncommittal end to it. Instead of telling someone to their face that she no longer wants to be with them, Raegan runs. She runs and she bails and she avoids having tough conversations and dealing with emotions because it makes her uncomfortable. That is, as you might have deduced, why she is a “lone wolf” archetype. She doesn’t want to get to know her roommates because forming attachments only leads to heartbreak. It’s the same kind of philosophy that Coach held when he explained his “clean break” at the end of last season. So pairing Winston — arguably the most emotional and eager member of the group — with Raegan in “Wig” proved to be both hilarious and heartwarming. Winston goes overboard in everything he does, from pranks to friendships. And so his desire to befriend Raegan leads him to follow her on her jog, accidentally tell Camilla that Raegan is in Los Angeles, and irritate Raegan. In order to get his new roommate to open up about her emotions, Winston tries to do a mock break-up with her, playing the part of Camilla. Eventually, Ragan becomes fed up with the amount of work she has to put into being emotional and feelings-oriented, so agrees to do a roommate dinner on one condition: Winston breaks up with Camilla FOR her. As you can surmise, this goes horribly awry and leads to Camilla storming into the loft with Winston in tow, demanding to know why Raegan couldn’t woman up and break up with her on her own. It’s in this moment though that I found something really special about New Girl click again — Nick, Schmidt, and Cece all create an elaborate story in order to aid Raegan in her lie to Camilla. They fully commit to helping out this relative stranger, and that’s really all you need to know about the group in a nutshell. If you are one of them — whether or not you want to be — they are for you. They will fight for you and protect you, whether the cause is serious or stupid, and whether or not it makes them look completely idiotic. These people? They’re all in. And that’s something that Raegan sees clearly in this episode. In her debut episode, Raegan agreed to move into the loft because she saw how passionate and crazy Nick, Winston, Schmidt, and Cece were. And a small part of her wanted to be a part of that. Now that she is, I think she’s starting to realize what that means for her. It means she’ll be supported. More than that, though, it means she’s actually WANTED around by these people. They want to know her and treat her like a person, not just a roommate. We should all be lucky to have similar friends. Jake Johnson was HYSTERICAL in this episode. He seriously was so on-point with Nick’s reactions and responses to everything. But really, “Wigs” played to the comedic strengths of each actor — from Max Greenfield’s elaborate Irish carnival mini-monologue, to Cece’s snark, to Winston’s overzealous acting to Nick trying to eat a burrito and talk. Everything was so perfect. Question: Did Schmidt get Cece an engagement ring sometime between last week’s episode and this one? She definitely has one on and though I don’t need to see the process of them getting the ring, I feel like there should have at least been a brief moment mentioning it. “WHY YOU IS BREAKIN’ UP WITH ME? !” Lamorne Morris’ delivery of that line and the whole scene had me doubled over with laughter. Okay, honestly? Jake Johnson as Nick Miller singing “Drunk in Love” is the best thing I have ever seen on this show and I am not even exaggerating. I’m laughing just thinking about it. Winston has been dumped 47 times... and once on his birthday. Just so you guys know. Nick, Winston, and Cece are building a treehouse together and that’s so important to me. What did you all think of “Wig”? Hit up the comments below and let me know!